A free event to celebrate the United Nations International Day of Yoga. Available For 58 More Days! Show support & receive free parking, exclusive lounge access, 30 days of Yoga and more. Show your support for the Festival and be present to connect with attendees. Ongoing online/social media exposure as well as acts as the host for the Food Court? Available For 38 More Days! This sponsorship provides amazing perks and great exposure to local, health-minded, active individuals. Title Sponsorship makes you a co-presenter of The Festival of Yoga & Healthy Living. What is The Festival of Yoga & Healthy Living? The Festival of Yoga & Healthy Living, hosted by Pilgrimage of the Heart Yoga, returns for the fourth year to celebrate the United Nations International Day of Yoga. This free, all-ages event will be held on Sunday, June 23, 2019 from 8am to 4pm at Waterfront Park in Downtown San Diego. San Diego nonprofit OG Yoga is honored to be the Festival's beneficiary for the second year in a row. Community Involvement: Large community of San Diego locals. Your participation in the festival helps keep your brand top of mind with local customers. Increase Your Online Reach: Each of the sponsorship opportunities includes online promotion of your business through social media. Your Tax Deductible Sponsorship Supports OG Yoga: Your sponsorship not only provides an opportunity to build brand awareness for your business, it also allows you to make a tax deductible donation to a great cause. OG Yoga is a San Diego nonprofit whose mission is to deliver trauma and diversity informed mindfulness-based yoga through partnerships with organizations serving marginalized individuals to support healing, resilience, self-development and positive social change. Sponsorship amounts above the fair market value of the good/services received may be tax-deductible through our nonprofit partner, OG Yoga; please consult your tax advisor. Show Your Support: If you're an individual who wants to show your support, we offer a $250 Festival "Founder's Circle" Sponsorship that includes fantastic perks like a free parking spot during the festival, access to an exclusive tent/lounge area, 30 days of free yoga at Pilgrimage Of The Heart, and much more. See below for details. Sponsorship amounts above the fair market value of the good/services received may be tax-deductible through our nonprofit partner, OG Yoga; please consult your tax advisor. 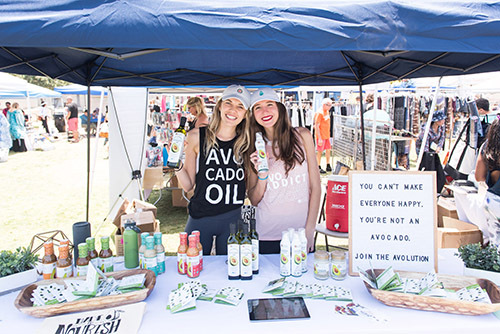 The Friends of Sponsorship + Booth Sponsorship offer the opportunity to show your support for the Festival of Yoga & Healthy Living and have a presence on-site day of to connect with attendees at the event. Logo on All Posters and Postcards Sent to Presenters and Studio Partners. $1,500 sponsorship for all of the above listed benefits. (5)Social Media Posts via Festival Social Media. (You will be asked to provide text, #s, and different pictures for each post in order to showcase your business in alignment with your business' advertising protocols). Print Exposure Logo on All Posters and Postcards Sent to Presenters and Studio Partners. $2,500 sponsorship for all of the above listed benefits. Your Investment: $5,000 sponsorship for all of the above listed benefits. Show your love for the community and feature your brand/business by becoming Title Sponsor for the Festival of Yoga & Healthy Living. Becoming the Title Sponsor makes you a co-presenter of the Festival. It provides the most perks and greatest exposure to a target demographic of local, health-minded, active individuals. (15) Social Media Posts via Festival Social Media. (You will be asked to provide text, #s, and different pictures for each post in order to showcase your business in alignment with your business' advertising protocols). Print Exposure: Predominant Logo on All Posters and Postcards Sent to Presenters and Studio Partners. Direct Participation: Complimentary Exhibitor Space (must provide your own tables/tent/chairs). $10,000 Sponsorship for All of the Above Listed Benefits.